The next day was Thursday 25th. We started from the camping site towards Frankfurt where we were supposed to meet Juha, Jenni and Timo. The weather was sunny with some clouds here and there. As our goal for the day was to reach Frankfurt as soon as possible, we rode most of the way on autobahn. Lane splitting through the occasional traffic jams we made good speed and arrived at our destination at about 6 pm. One of the main streets in Frankfurt had road construction going on, and that caused a jam that came up several kilometers in the autobahn. It took some 30 minutes for us to drive through it, but later we heard from Juha, that they had spent several hours in the same jam. We checked in to the good old King George Hotel. KG was located not far form the main Railway Station and had very decent prices. 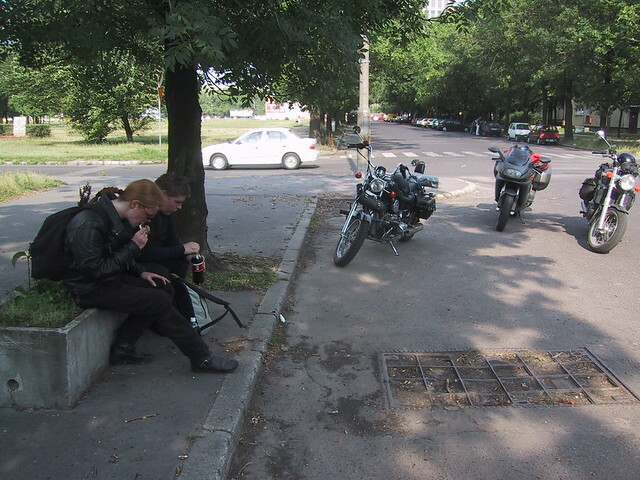 That again, it was in the crossing of a whore-street and a junkie-street, which added excitement to our traveling experience - will our bikes be there in the morning? After leaving our stuff at the hotel, we joined Juha and Co. near Speak Eazy where they were having dinner. We grabbed some food and entered again the metal cave where some of us had spent many merry nights about a year ago. To our surprise the bar owner remembered us and even had some of the Kahlua left - apparently the Germans don’t appreciate White Russians. Next morning Bergie left us with the plan to visit Emil in Arnhem, Netherlands, some Midgard guys at Netrex in Woerden, Netherlands and Michel in Zurich, Switzerland, and to meet with Skoll in Munich later. Timo, Juha, Jenni and Skoll spent the day drinking beer in the numerous bars of Frankfurt and having some delicious steaks in Block House. When the evening came, it was once again time for Speak Eazy. Saturday morning Juha, Timo and Jenni continued towards Amsterdam and Skoll left for Munich where he was supposed to be working next Monday. With some 400 kilometers ahead and somewhat tried from the last evening, Skoll decided to take the autobahn. He arrived in Munich and after a quick shower decided to make acquaintance with the city’s nightlife. He managed to find the official party place called Kunstpark Ost which was an area with over 30 bars and restaurants. Most of the bars opened at 10 o’clock, but one was already open and to his pleasant surprise Skoll found out that the beer was for free there. Later he heard that the event was sponsored by the local football club. While drinking free Lövenbrau, he heard from a girl wearing Children of Bodom t-shirt that there was a also metal bar in the area. The place was called The Doom and it was furnished in horror theme with nooses and spiders hanging from the roof and skeletons laying the corners - pretty cool place all in all. Sunday went pretty quietly washing clothes and resting. Form Monday and Wednesday Skoll was working. Bergie arrived to Munich late Tuesday evening. He also had some business to attend to Wednesday morning so our start to Wacken was delayed to 1 pm. After having a quick lunch we finally managed to hit the road. Having about 900 kilometers ahead of us we know the day wasnt going to be a joyride. Our ride started with sunny weather but after about 200 kilometers we were hit by the first shower of rain. It was over as quickly as it started lasting only long enough to wet us totally. When next time we saw dark clouds ahead we stopped and jumped into our rain suites. We were hit by a few more showers and they seemed to stop. At a gas stop we removed the rain suites and continued in the sunshine  only to drive into the heavies rain of the whole trip. Visibility was about 10 meters and even the cars had slowed down to 40 km/h. We stopped under the first bridge where two other bikers has stopped. Soaking wet and cursing our luck we first waited for the rain to end, but as it didnt show even the lightest sign of ceasing, we had no option but to continue, once again wearing the fullbody condoms. At the same stop Bergies camera also broke down. At some point the rain finally ended. We rode on in the creeping darkness. Luckily it didn’t rain anymore that day, but without being able to see the sky in the darkness, we continued in rain suites. At midnight we had our last stop. After 11 hours of driving Skoll especially was feeling pretty weary, but with the power of Red Bull we pushed on. We arrived in the Wacken village in the middle of the night. We had a quick stop at the only ATM in the village and continued to the festival area. Starting his bike again, Skoll noticed, that kick-start didn’t work anymore, but didn’t pay any attention to that. At 1 am we finally arrived to our camp. Juha, Timo and Jenni were there as well as other Finnish metalheads. In addition to the two of us, there was also Johanna who had dared to drive from Finland to Wacken with her bike. First things first, we emptied a few beers cans, set up our tent and then went to check the festival area. The feeling when we finally got our beers after 12 straight hours of driving was indescribable. And being back in Wacke - the biggest metal festival in Europe - felt good also.